If you ask pretty much any skydiver what SSK is and does, they’ll immediately start talking about CYPRES. If that’s your knee-jerk reaction, too, lean in: There’s far more to it. 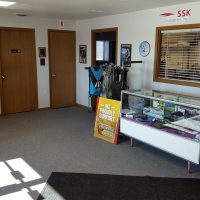 While that’s not an unfair assumption–after all, SSK has been the US Stateside service center for the German-manufactured AAD since back in 1991–the full story of SSK is much richer (and more interesting) than that would imply. SSK President Adam Schmucker, son of SSK Founder Cliff Schmucker, tells that story best. A-license check dive, and first jump with my dad. Geeking the camera a bit on exit. My dad is jumping one of his go to Sweethog rigs. First off: SSK predates Airtec by eight years. It debuted in 1983, started up by Adam’s dad, Cliff, along with a couple of his friends. 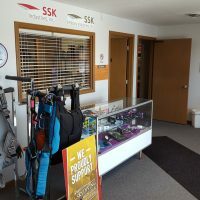 The little crew of maker-skydivers built harness-container systems, and the entire operation was housed in a tiny shack at Skydive Cincinnati, a small Cessna drop zone in Waynesville, Ohio. One of their creations–the “Sweethog” container–was manufactured up until 1995. Aside from his jumping, designing and sewing, Cliff was the President of the Parachute Industry Association for twenty years. It was at a PIA meeting when Cliff and CYPRES inventor Helmut Cloth first crossed paths. Helmut debuted his new technology to a bug-eyed crowd, and Cliff hustled over to ask his own battery of questions. Cliff dove right in. Cliff decided, on his own, to perform an independent set of tests so he could tell other jumpers with confidence that the CYPRES works. To wit, Cliff and two others performed actual live jump tests, as well as drop tests, to confirm Airtec’s results. It was around that time that Adam first met Helmut. Adam was 7 years old at the time. As the seasons rolled past, Cliff started getting more and more involved with the CYPRES. As his CYPRES involvement ramped up, he let the Sweethog disappear, concentrating his energies on collaboratively perfecting the AAD. 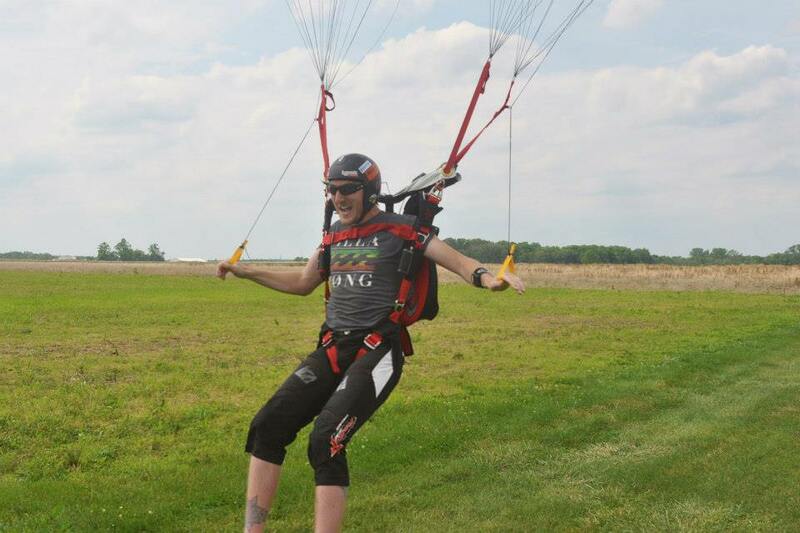 For his own part, Adam was content to be a skydiver. He loved his dad and was inspired by his entrepreneurial spirit, but held no aspirations to be part of the family business. When it was time to go off to school, Adam headed to Miami University (in Oxford, Ohio) to major in Marketing and minor in Entrepreneurship. He jumped constantly during his years at school and, when he graduated in 2010, went back to work at SSK. Things were really picking up speed by this point. 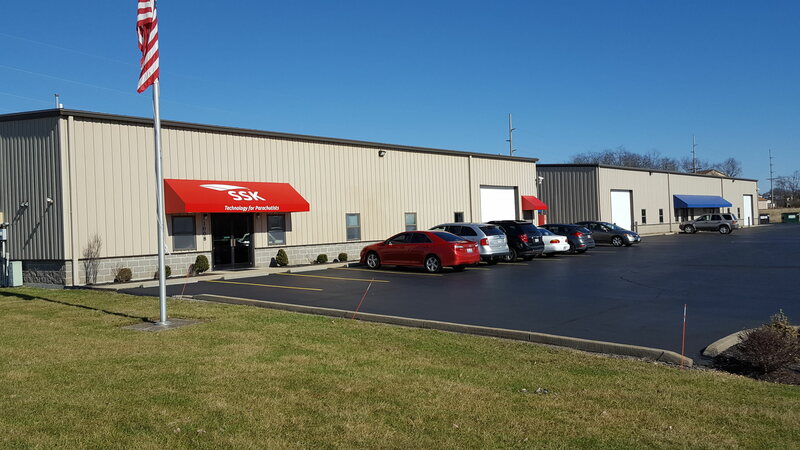 SSK had moved out of the little shack and into a three-building complex of three warehouse-sized, purpose-built structures. 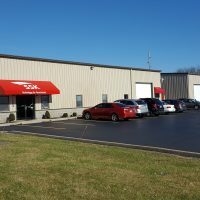 Set up to be a mirror image of the home factory in Germany, the Ohio complex sports identical equipment and works like a backup, offsite server. The design goal is simple: if a disaster occurred either in Ohio or in Germany, although response times would be delayed, the remaining facility could take over and maintain forward progress while the recovery efforts took place. In 2013, however–when Adam was just 25–his course changed completely. 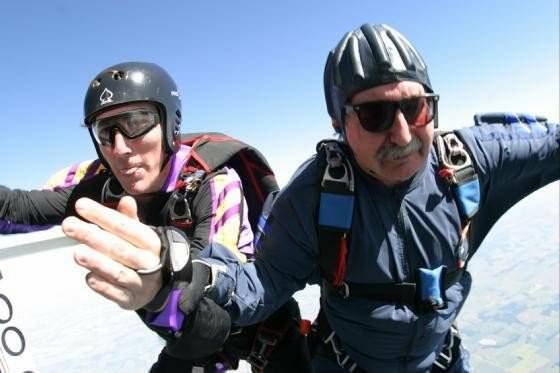 Cliff passed away in a skydiving accident. Amidst the shock and mourning, it was time for Adam to take up the helm. There were a lot of moving parts to oversee, as Adam well knew when he stepped into his father’s place. 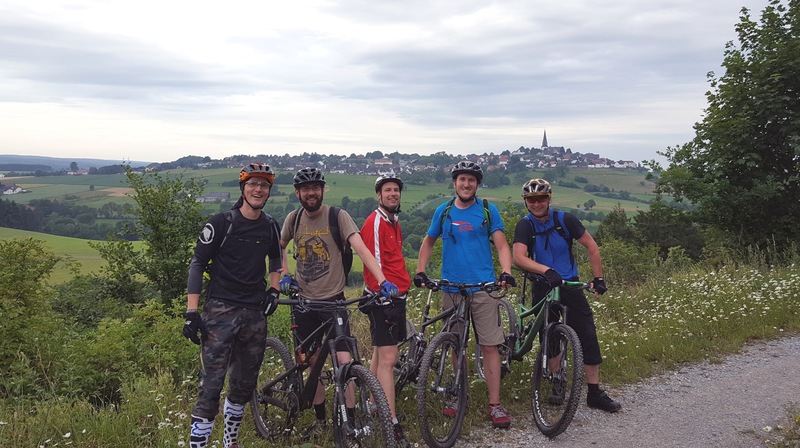 Mountain biking in Germany with Martin Thannheiser of Airtec and other local riders. Eric’s work area where all the CYPRES units get checked in prior to maintenance. 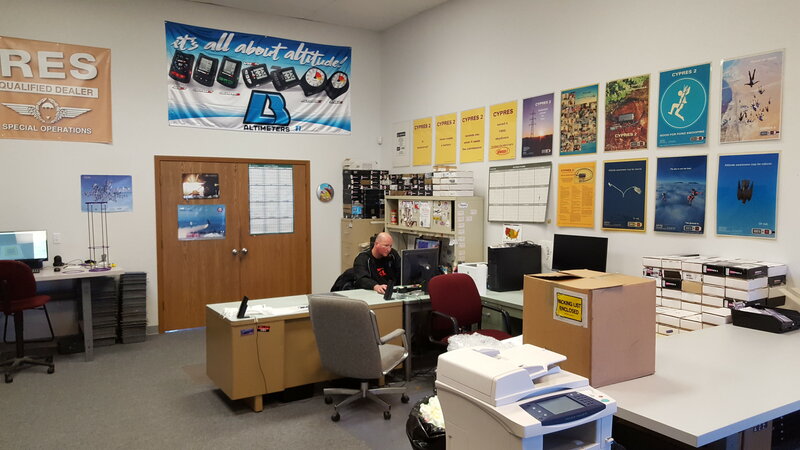 Eric has worked here for about 22 years and also does the L&B maintenance and repairs. In this room, you will hear a wide range of music blasting from Prince to Slayer. When people call SSK, Eric is most often the one people speak with. With all that going on, it might be a little amazing that SSK has a life that extends beyond its family ties with CYPRES. Indeed, it does. 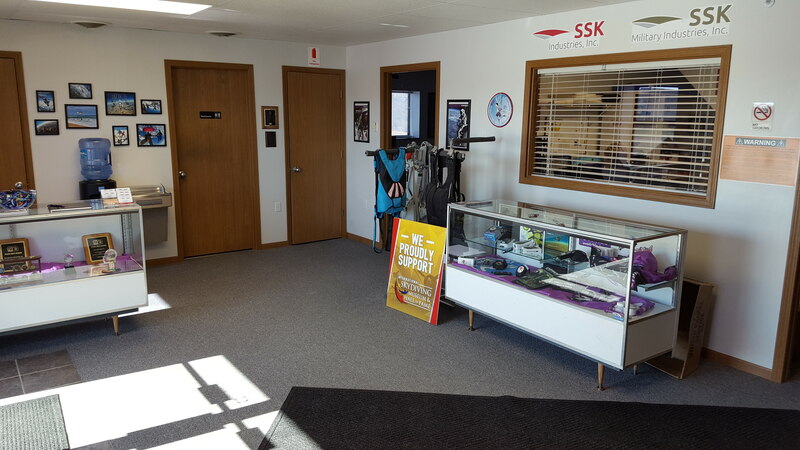 For example: Last year, SSK became the service center for all of the Larsen & Brusgaard altimeters outside of Europe. 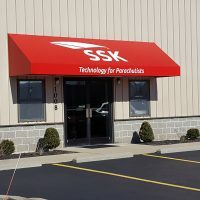 Since the mid-1990s, the company has also been working with the manufacturer of a military parachuting simulator–Systems Technology, Inc., based in California–to continually develop and distribute that company’s full-immersion VR simulator. As you might imagine, recent VR technology has upleveled that offering like a rocket ship. 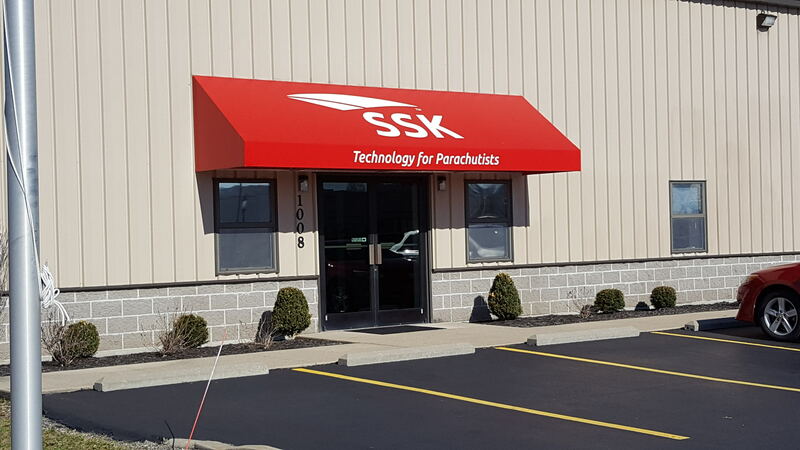 SSK designs and builds the hardware in Ohio: a slick-looking frame with the motors mounted at the top, along with a variety of military harnesses adapted for the purpose. 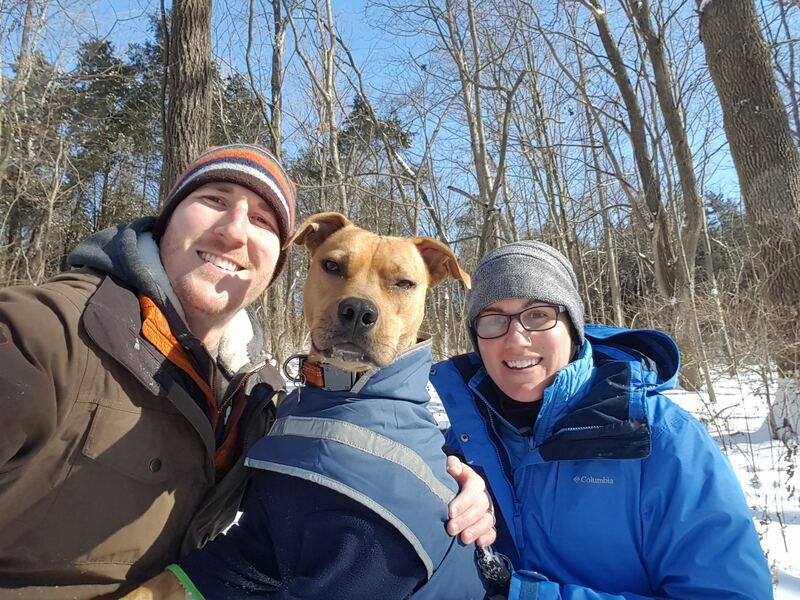 Adam, Lucy and Laura and on a New Year’s Day hike. 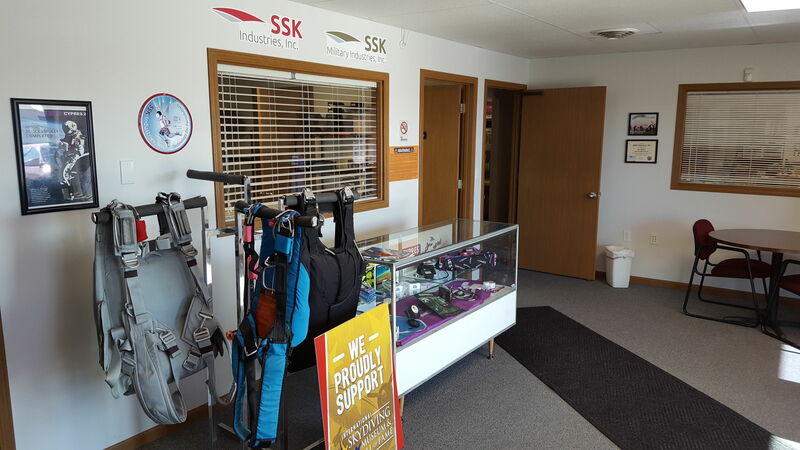 On the manufacturing side, SSK fabricates a range of military-side accessories that must be US-made: altimeter wrist mounts and CYPRES pouches among them. They also make carrier plates for the navigation boards that hold a military parachutist’s compass, GPS and altimeter on HAHO jumps. Adam’s “real mission” at this point, as he explains it, is to get more current as a skydiver. A diehard freefly guy, he’s lucky enough to live directly between two active dropzones: the little Cessna operation where SSK was founded and the much-larger turbine DZ of Start Skydiving in Middletown. With that real estate, it might be shocking that it takes such an effort to get on a load–but SSK is a more-than-full-time job, and Adam truly loves it. Even though it has kept him on the ground more than he’d like, for Adam, the hard work is worth it.